Aerial refuelling aircraft are strategic assets for any armed force, as airborne stations capable of prolonging the flight time of fighter jets and reconnaissance aircraft, allowing them to do their job for longer. Airforce-technology.com lists the world's biggest and most effective refuelling aircraft by fuel payload capacity. The KC-10 Extender is military tanker/transport variant based on the Boeing DC-10 aircraft. It serves as both conventional aerial tanker and receiver aircraft. It can carry 160,200kg (356,000lb or 160.2 tonnes) of fuel, 75 personnel and about 76,560kg of cargo. The Extender is equipped with three main wing fuel tanks and three large fuel tanks below the cargo floor. It can refuel aircraft through an advanced aerial refuelling boom or a hose and drogue centreline refuelling system. The boom operator controls the refuelling mission by using a digital fly-by wire system. 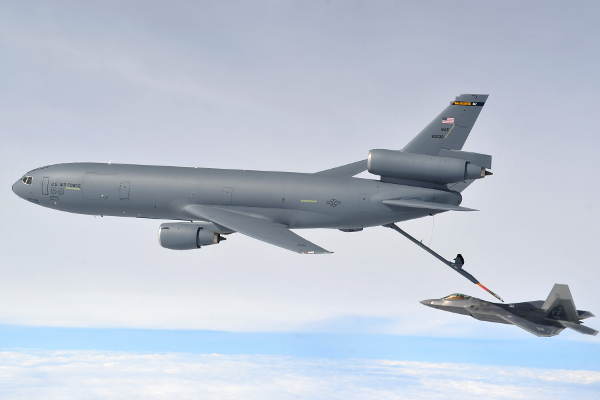 The KC-10 transfers fuel at a maximum rate of 4,180L/min through aerial refuelling boom and can deliver 1,786L/min using a hose and drogue refuelling system. The aircraft is fitted with automatic load alleviation and autonomous disconnect systems to enhance safety during aerial refuelling operations. The Airbus A330-200 Multi Role Tanker Transport (MRTT) is a new generation aerial refuelling aircraft based on the A330-200 passenger jet. The aircraft can hold 111t (245,000lb) of fuel in its wings and carry up to 300 personnel, or 45t of cargo. It is in service with the Royal Australian Air Force, UAE Air Force, Royal Air Force and Royal Saudi Air Force. The advanced Airbus Military Aerial Refuelling Boom System (ARBS) aboard the aircraft ensures the fastest fuel transfer and allows the refuelling of receptacle-equipped F-16 Fighting Falcon, F-35A Lightning II, as well as the A330 MRTT itself (when fitted with an UARRSI). The A330 MRTT integrates two Cobham 905E under-wing hose and drogue pods to refuel probe-fitted aircraft such as Eurofighter and Tornado. The Cobham 805E Fuselage Refuelling Unit (FRU) aboard the aircraft ensures the refuelling of large probe-equipped aircraft, such as the A400M and the C295. The Air to Air Refuelling (AAR) systems are controlled from an advanced Fuel Operator Console installed in the cockpit, while day and night refuelling is supported by a video monitoring system. The KC-46A is a next generation multirole tanker aircraft based on the Boeing 767 commercial aircraft. The KC-46A is currently in the production phase, with the first aircraft scheduled to be delivered to the US Air Force (USAF) in 2016. The KC-46 will be able to refuel all fixed-wing aircraft through its advanced fly-by-wire boom based on the proven KC-10 boom, and state-of-the-art centreline and wing-mounted hose and drogue systems. The aircraft will have a capacity to hold 96,297kg (212,299lb) of fuel. The refuelling boom will transfer the fuel at a rate of 4,542L/min, while the wing air refuelling pods and centreline drogue system will deliver fuel at an offload rate of 1,514L/min. The aircraft's Air Refuelling Operator System (AROS) will integrate a dual instructor station with control sticks, 24-inch monitors displaying 3D refuelling imagery and data recording and camera systems. The Boeing KC-135 Stratotanker is one of the prime aerial refuelling aircraft in service with the USAF. The first aircraft was handed to the Castle Air Force Base in June 1957. The KC-135 fleet performed 813,000 aerial refuellings for combat aircraft during the Vietnam conflict. The KC-135 can carry a fuel load of 90,718.4kg (200,000lb). It primarily transfers the fuel through the flying boom and also uses a special shuttlecock-shaped drogue to refuel aircraft with probes. The aerial refuelling mission is monitored by a boom operator sitting in the rear of the aircraft. The service life of the KC-135 is extended through re-skinned wings and more powerful and fuel-efficient engines. The re-engined tankers, designated as KC-135R or KC-135T, offer 50% more fuel offload capability and 25% more fuel efficiency than the original KC-135A aircraft. The Ilyushin Il-78 (Nato reporting name: Midas) is an aerial refuelling aircraft derived from the Il-76MD military transport aircraft. The Il-78 is capable of conducting aerial refuelling of three different aircraft at a time during day and night. The aircraft can carry 85,720kg (188,584lb) of fuel in its fuselage tanks and wing tanks. It can be modified, under field conditions, as a transport aircraft for accommodating troops, cargo and equipment. The cargo compartment includes two fuel tanks. The aircraft employs three UPAZ unified refuelling pods to transfer fuel from fuselage tanks and wing boxes. The Indian Air Force uses a modified Ilyushin Il-78 version, known as Il-78MKI, equipped with Israeli fuel transfer systems. The Boeing KC-767 International Tanker is a modern aerial-refuelling aircraft capable of conducting air-to-air refuelling, cargo/passenger transport and medical evacuation missions. It is derived from the 767-200ER passenger aircraft. The KC-767 tanker can be configured for multiple interior layouts, while retaining its tanker capability. The aircraft allows full interoperability with European Union and Nato countries. It can carry 73,028kg of fuel, which is transferred through advanced boom system, wing air refuelling pods and centreline hose drum unit. The aerial refuelling boom transfers 3,407 litres of fuel per minute, while hose drum unit and wing tip air refuelling pods can deliver 2,271L/min and 1,514L/min respectively. The KC-767 is equipped with a high-tech boom operator station interfaced with camera systems. The A400M is a versatile dual-role transport and tanker aircraft delivering a cost-effective aerial refuelling (AR) capability to the armed forces across the globe. It is the only tanker with the ability to refuel the entire range of probe-equipped military aircraft. The A400M transport aircraft can be converted into a two-point tanker configuration within two hours. The A400M tanker, with a fuel capacity of 50.5t (111,330lb), can be mounted with two additional cargo hold tanks of 5.7t of fuel each. The air-to-air refuelling is performed through two hose and drogue under-wing refuelling pods (1,500L/min flow rate) or through a centre-line fuselage refuelling unit (2,250L/min). The three video cameras installed in the aircraft enable the crew to monitor the refuelling mission. The aircraft can fly at slow speeds and low altitudes to refuel helicopters, as well as at higher speeds and altitudes to refuel fighters such as Eurofighter, F/A-18 Hornet and Rafale, as well as large aircraft including C295 and C-130 Hercules. It can also be equipped with a removable refuelling probe to receive fuel from another A400M (buddy refuelling). The A310 MRTT is a multirole tanker transport aircraft based on the Airbus A310 jet airliner. It performs the dual roles of aerial refuelling and transport. The aircraft is currently operated by the German Air Force and Royal Canadian Air Force. The A310 MRTT is a two-point tanker with a standard fuel payload capacity of 42,000kg (92,594lb). The fuel is transferred by under-wing hose and drogue refuelling pods mounted on the under wing pylons. Each pod can deliver up to 1,500 litres of fuel per minute. The A310 MRTT is equipped with the operator's station behind the cockpit and a mission computer subsystem for refuelling missions. The MRTT can be configured for passenger and cargo transportation, and medical evacuation missions. The KC-130J aerial refuelling (AR) aircraft was developed by Lockheed Martin for refuelling tactical aircraft and helicopters. The aircraft can also be used for rapid ground refuelling. The KC-130J fleet in service with the US Marine Corps (USMC) accumulated more than 20,000 hours of flight in Iraq. The KC-130J AR tanker leverages the tanker technologies of the combat proven C-130 Hercules. The KC-130J can carry 27,834kg (61,364lb) of fuel when fitted with external tanks. It can simultaneously refuel two aircraft at a transfer rate of 1,135.6 litres per minute. The aircraft's multimission capabilities allow it to conduct a variety of missions, such as cargo transportation, medical evacuation (MEDEVAC), search and rescue (SAR) and airborne assault. Embraer Defence and Security's KC-390 is a tactical military transport and tanker aircraft being developed for the Brazilian Air Force. The multirole aircraft can be used for in-flight refuelling and transportation of cargo and troops. The aircraft can be quickly configured as a tanker. It will be equipped with wing-mounted aerial refuelling pods and aerial refuelling receiver probe supplied by Cobham. It will carry 23.4t of fuel in its wings. The aircraft will be able to operate from short and semi-prepared airstrips. The full fly-by-wire flight control technology aboard the aircraft will ensure high performance, while reducing the work load of crew. The KC-390 is scheduled to go on maiden flight in 2014 and enter into service in 2016. From their inception, helicopters were designed to lift heavy loads externally and drop them off in hard to reach areas. Fighter aircraft are a vital component of any air force and examples such as the F-35 Lightning and Eurofighter Typhoon demonstrate their vast superiority. A KC-10 Extender refuels an F-22 Raptor during Exercise Razor Talon. The A330 Multi Role Tanker of the Royal Australian Air Force achieved IOC in 2013. The KC-46A is intended to replace the ageing fleet of the KC-135 Stratotankers in service. A KC-135 Stratotanker, deployed from Royal Air Force Mildenhall, refuels an F-15C Eagle. The IL-78 refuelling aircraft is in service with Russia, Ukraine, China, India and Pakistan. A Boeing KC-767 tanker aircraft refuels a B-52 over California's Mojave Desert. The multirole A400M from Airbus Military can serve as an aerial tanker. An Airbus A310 MRTT from the German Air Force shown at the Paris Air Show 2007. Two KC-130J Hercules aircraft stagger themselves during a refuelling training exercise. KC-390 is scheduled to go on its maiden flight in 2014 and enter service in 2016.
airforce-technology.com is a product of Net Resources International. Copyright 2012 Net Resources International, a trading division of SPG Media Limited.